For other places with the same name, see Ross Island (disambiguation). Sir James Ross discovered it in 1840, and it was later named in honour of him by Robert F. Scott. Today Ross Island is home to New Zealand's Scott Base, and the largest Antarctic settlement, the U.S. Antarctic Program's McMurdo Station. Greenpeace established World Park Base on the island and ran it for five years, from 1987 to 1992. Because of the persistent presence of the ice sheet, the island is sometimes taken to be part of the Antarctic mainland. Its area is 2,460 square kilometres (950 sq mi); only a small portion of the island is free of ice and snow. The planet's southernmost active volcano, Erebus (3,794 m or 12,448 ft), as well as the dormant volcano Terror (3,230 m or 10,597 ft), are situated on the island. They were named by Captain James Ross after his ships HMS Erebus and HMS Terror. The third highest elevation is Mount Bird, with Shell Glacier and Endeavour Piedmont Glacier on its slopes. Abbott Peak stands between Mount Erebus and Mount Bird. Gamble Cone and Kyle Cone stand in the east of the island. Beeby Peak is 2.4 nautical miles (4.4 km) east-northeast of the summit of Mount Bird. 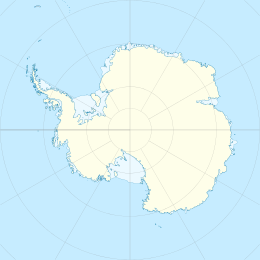 Despite its relatively small size, Ross Island is the world's 6th highest island and the highest island in Antarctica. It has the highest average elevation of any island. Many features on or near Ross Island have been charted and named by various survey and exploration groups. Mount Erebus is the island's most prominent landmark. Hut Point Peninsula, the site of McMurdo Station (US) and Scott Base (New Zealand), projects southwest from its lower slopes. Barne Glacier projects off its western slopes. To the north of Mount Terror are the Kienle Nunataks. The far eastern point of the island is called Cape Crozier. On the west side of the island is rocky Cape Evans, which forms the north side of Erebus Bay. Land fast sea ice in the foreground. Ross Island in the background. 77° 30′ S Latitude 168° 00′ E Longitude. ^ LeMasurier, W. E.; Thomson, J. W., eds. (1990). Volcanoes of the Antarctic Plate and Southern Oceans. American Geophysical Union. p. 512. ISBN 0-87590-172-7. Wikimedia Commons has media related to Ross Island.